Slab leaks are not uncommon in Murrieta, CA. Many buildings have a concrete floor, or slab, under the structure. Damage can form over time from climate changes, leaking pipes and even the chemical composition of your water. These types of problems occur regularly, but if the issue is caught in its early stages, a professional can easily fix it. L&S Turnkey Plumbing & Restoration is a local plumbing company offering slab leak repair in Murrieta. We are available 24/7 so that we can make the repair before more extensive and costly damage occurs. To better help you recognize a problem in your building, here is some information about slab leaks. When water gets below the concrete foundation of your house or any other type of building, a slab leak may form. These types of leaks are caused by hot or cold water lines that run under the foundation. Slab leaks can be as small as a pinhole in a pipe or as large as a gushing blast of water; regardless of size, both can cause significant damage. Corrosion – Water passing through pipes, combined with water in the soil around the pipes, causes a chemical reaction. This reaction then leads to corrosion. Many older homes feature pipes made of copper or galvanized metal, two materials that are especially prone to corrosion. Holes in the waterline are formed in corroded pipes, leading to lower water pressure and damage to the building’s slab. Vibrations – Running water can also cause pipes to vibrate, a movement that is more damaging when the temperature of that running water also causes the pipes to expand or contract. These combined movements can force those pipes to shift into spaces not originally intended for them. For example, expanding pipes could start to rub against surrounding materials, other water lines and the slab itself. 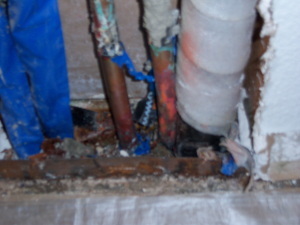 Repeat shifts can lead to cracks and leaks in these pipes. Poor construction – When your property was constructed, the builders may have improperly insulated or incorrectly supported the pipes under the slab. Without the proper installation, those waterlines could receive too much pressure and crack. Do not delay, call L&S Turnkey Plumbing & Restoration to verify your leak and find the best course of action for repair. Leaving a damaged water line under your property is never a good idea. The longer you wait, the more damage the slab leak will create. If you suspect that you may have a slab leak, we are insurance-approved and are typically able to work with your insurer. We are available 24/7. Call now!